Michael is a name. It’s quite common. Yet, there are people who make it extraordinary. One is a musician. The other is an athlete. You could also call him a fashion designer. He’s proved his talent on the court and the business office. If you don’t know who I’m talking about. I’ll just let you know, “I want to be like Mike.” Michael Jordan is one of the greatest basketball players of all time. With help, Jordan became a separate and equal brand from Nike today. There are numerous bibliographies about him. I bet you could find at least two at your local library. In 2012, he gave us the final pieces of his past, present, and future. When your done, it’s a great book to leave on a coffee table. Besides basketball, Michael had his own style. It’s changed and matured overtime. Overall, he’s always had a suave style. He is still debonair and original. He’s refused to change that image for commercials and endorsements. I love that the book shows the importance of personal branding and image. Style impacts public opinion. Style is more than clothing. Driven From Within brings out the creativity behind each shoes. They had to play well on the court, and tell a story. The storyboards behind the shoes are fantastic. Yes, Michael didn’t dream up these shoes on his own, but they were structured around his life. This is why Jordan, the brand, shares an equal portion of recognition in the book. Plus, the book has more to offer. Motivation and dedication flow throughout the book. In fact, I sent a few tweets as I read the book, because I wanted people to be impacted by his words. The mind can be your greatest enemy. A negative mindset will always hinder what the body is capable of. 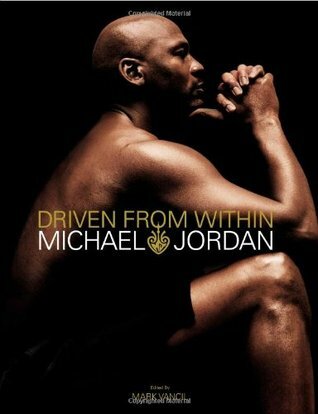 Yes, Michael Jordan is a talented basketball player, but he worked for it. He treated practice like the 4th quarter of a championship home game. Through visualization, he was able to exercise his mind on and off the court. I’ve used this book to remind me that my attitude towards everything I do affects the outcome. Sometimes, I pull the book out to remind myself that great reward doesn’t come easily. Any goal that does is easy to cheat on. The book is truly amazing and will have you reflecting on your life.